Some time back I had posted about the specifications and features of the Motorola Q Phone. Now that the phone has been launched in the market, I have found a nice review of this phone and it is worth reading. The Q excels in its hardware specs and capabilities. The 2.5 inch screen features a 320�240 resolution at 65k colors contained in a 2.5 inch wide and 0.45 inch thick housing weighing only 4 ounces. At 2.5 inches wide, the Q feels a little awkward to hold at first. As one reviewer put it, using the Q can feel like you�re talking to a piece of bathroom tile. 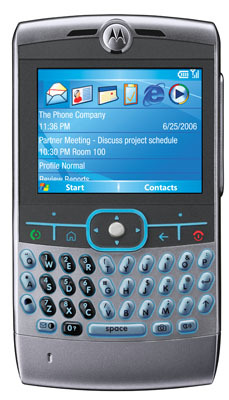 However, the Q is much more tolerable than the brick form factor of the Treo 700. There is a mini QWERTY keyboard with adequately spaced out keys, allowing me to pump out enormous text messages in a fraction of the time it would take on a regular cell phone. Yet, the send/end keys above the keyboard feel a bit mushy, are awkwardly placed and lack sufficient tactile feedback. Let me know about your opinions of this phone after you read the review.